In a country that is suffering another food crisis, only two years after the last one that I witnessed first hand, it’s great to be able to work on a story that is more positive. Yes, many families in Niger are once again struggling to feed their children but at the same time something new is taking root. 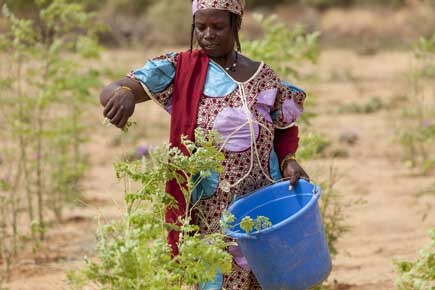 The unremarkable looking moringa tree has become a frontline weapon to fight the recurring droughts that have hit the West African nation – and it’s an all female gardening club that are leading the way. With support from World Vision more than 200 people have now been trained to grow and harvest the nutritious morgina tree leaves. I worked on the innovative #shareniger project lead by Liz Scarff to highlight the escalating food crisis in the Sahel for World Vision. I commissioned photographer Mike Goldwater to shoot the compelling images used for the campaign and used them to create media interest. They were published by the BBC – check out the gallery here. The campaign reached over 7 million people through twitter and the Department for International Development agreed to match fund World Vision’s public appeal. It’s great to know that more families will manage to get through another year of failed harvests. But we need to be working long term – using innovative approaches like the moringa tree – to help families become much more resilient to these recurring droughts so that they aren’t lurching from one crisis to the next.